Both teams play in group b of the group stages of the tournament with Haiti and Peru. As the Copa America kicked off with the hosts, the USA playing against Colombia but losing the match by 0-2 with goals from Zarate and James Rodriguez and Colombia is at the top of the table with three points from the one game played. 05th June 2016 at 07:30 (IST). Then we move on to the midfield we have Coutinho, Willian, Lucas and Casemiro who are all talented and possible game changers and then in the attack, we have Gabriel and Hulk. In their last three International Friendlies, they have won three, against Costa Rica by 1-0, against the USA by 1-4 and Panama by 0-2. They played against Panama in their last match and won the game by 0-2 as Jonas scored the opening goal in the 2nd minute of the match and then Gabriel made it 0-2 in the 73rd minute of the match. 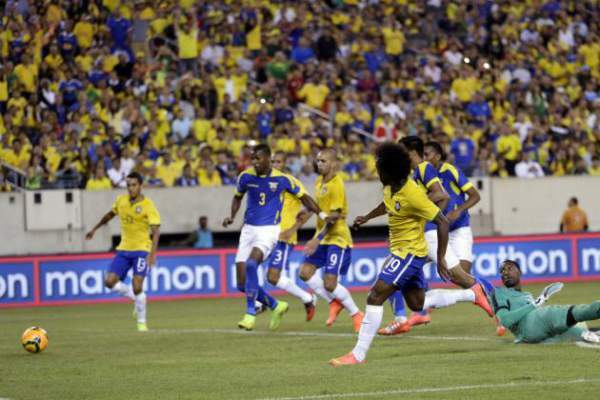 Ecuador is ranked 12th in the FIFA rankings, and they have an excellent squad to prove that. The players to look out for on this team are midfielder Jefferson Montero, who plays in Swansea, defender Walter Ayovi, who plays in the Mexican club Monterrey and the forward Enner Valencia who plays in the English club West Ham United. Alves, Dani Alves, Miranda, Marquinhos, Luis, Coutinho, Willian,Douglas, Lucas, Hulk, Jonas. Maximo Banguero, Achilier, Arboleda, Walter Ayovi, Frickson, Aruro Mina, Antonio Valencia, Angel Mena, Martinez, Larrea, Enner Valencia, Balonas. Come back for the match preview, prediction, result, highlights, full scorecard, and other information. Stay tuned to The Reporter Times for latest Copa America news and other Football updates.